Price swings in stocks and currencies are becoming increasingly muted ahead of central bank policy reviews in some of the world’s biggest economies. 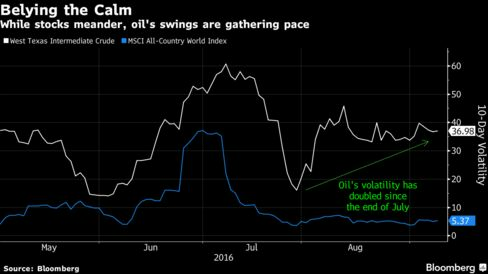 Oil rallied on signs a U.S. glut is easing, while yuan borrowing costs surged in Hong Kong. A gauge of the MSCI All Country World Index’s volatility is at a two-year low and a measure of exchange-rate moves in emerging markets is near its lowest in a month. Asian stocks held near a 13-month high on Thursday, while European and U.S. equity index futures were little changed. The euro edged higher before a European Central Bank policy decision. A rate for overnight yuan loans jumped to levels last seen in February amid speculation China is tying up supplies to deter bets on depreciation. Crude rose above $46 a barrel. While there are pockets of excitement in financial markets, price fluctuations are generally subdued. Prospects for a U.S. interest-rate increase in September faded this week after data showed slowdowns in hiring and business activity, while Japan raised its estimate of second-quarter gross domestic product before the central bank decides whether to add to record stimulus on Sept. 21. The European Central Bank is seen maintaining unprecedented stimulus on Thursday as President Mario Draghi updates growth and inflation projections. The Bank of America Merrill Lynch GFSI Market Risk Index, a measure of future price swings implied by options trading on global equities, interest rates, currencies and commodities, fell this week to its lowest level since Jan. 1. Different asset classes are influencing one another by the most since at least 2008, according to a Credit Suisse Group AG gauge known as the cross-market contagion indicator that tracks price relationships in equities, credit, currencies and commodities.. The MSCI Asia Pacific Index was down less than 0.2 percent as of 7:31 a.m. London time. Its 14-day relative strength gauge climbed above 70 this week, a threshold that indicates to some traders a pullback is likely. Hong Kong’s Hang Seng Index rose to a one-year high and the Shanghai Composite Index fluctuated after Chinese trade data showed export declines moderated in dollar terms last month and imports unexpectedly grew. Daily moves in the Shanghai gauge have been less than 1 percent for 17 days in a row, a phenomenon that last occurred in 2001. Japan’s Topix index fell 0.3 percent. The nation’s GDP expanded by an annualized 0.7 percent in the three months ended June 30, more than an earlier estimate of 0.2 percent. Nintendo Co. jumped 13 percent in Tokyo after the company announced plans to make its Super Mario Run game available on Apple Inc.’s iPhones from December. As investors assess the outlook for both U.S. and Japanese monetary policy, “it’s difficult to make a definitive move in either direction,” said Koichi Kurose, Tokyo-based chief market strategist at Resona Bank Ltd.
Futures on the Euro Stoxx 50 Index were little changed, as were contracts on the S&P 500 Index. The U.S. benchmark has held in a band of 1.5 percent for 39 days, the narrowest ever for that length of time. A 50-day volatility measure for the MSCI All Country World Index of shares has more than halved since the start of this month. The Bloomberg Dollar Spot Index fell 0.1 percent, nearing a two-week low. Australia’s dollar led gains among 16 major currencies with a 0.5 percent advance and the Taiwan dollar was the worst performer with a 0.2 percent loss. The Philippine peso sank to a four-week low after foreigners pulled $153 million from the nation’s stocks since the end of August, on track for the heaviest monthly net sales since November. China’s yuan weakened less than 0.1 percent in the onshore and offshore markets, declining for the first time this week. 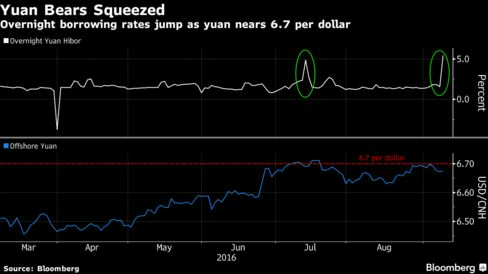 The overnight rate for yuan loans between banks in Hong Kong jumped 3.88 percentage points to 5.45 percent, a daily fixing showed. The equivalent rate in Shanghai increased by one basis point to 2.10 percent. The People’s Bank of China may have tightened liquidity in the offshore market, as it did in January, to make it prohibitively expensive for foreign speculators to short the yuan in the wake of a Group of 20 summit that ended Monday, according to Mizuho Bank Ltd.
U.S. Treasuries due in a decade were steady and yielded 1.54 percent. The probability of the Fed boosting benchmark interest rates at its meeting this month has dropped 10 percentage points this week to 22 percent, futures prices indicate. West Texas Intermediate crude climbed 1.7 percent to $46.25 a barrel, set for its highest close in more than a week. It’s risen about 7 percent in the past week amid optimism major producers will agree measures to support prices. U.S. crude inventories fell by 12.1 million barrels last week, the industry-funded American Petroleum Institute was said to have reported. A similar drop in official data due Thursday, which is forecast to show an expansion, would be the largest since 1999. Gold rose 0.2 percent, approaching a three-week high, and tin retreated in London from its best close since January 2015.